Notes: Rates are age-adjusted. Heart failure-related deaths are those with heart failure (ICD–10 code I50) reported anywhere on the death certificate (i.e., as an underlying or contributing cause of death). 1 Age-adjusted rate of heart failure-related deaths declined significantly from 2000 through 2012 and then increased from 2012 through 2014 for the overall population and for the non-Hispanic white and non-Hispanic black populations (p < 0.05). 2 Age-adjusted death rate was significantly higher for the non-Hispanic black population than for the non-Hispanic white and Hispanic populations (p < 0.05). 3 Declining trend in the age-adjusted rate of heart failure-related deaths for the Hispanic population from 2000 through 2014 was statistically significant (p < 0.05). 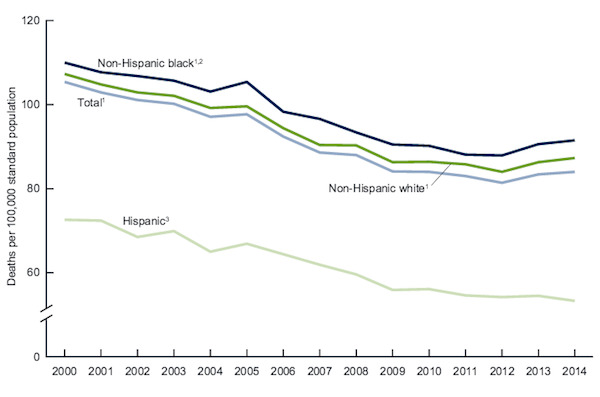 Data Source: CDC/NCHS, National Vital Statistics System mortality data, 2000–2014. This entry was posted in Medicine and Society Data Watch on January 6, 2016 by Genevra Pittman.